Pre-made adventures are super-helpful for the GM on the go. When necessary, they can just be dropped right into a game with minimal prep. Or, a GM can simply use one as a framework to do their own thing. Either way, more ideas floating around is nice. An Inner Darkness is a set of new adventures for Call of Cthulhu 7th Edition. The book is up on Kickstarter now. 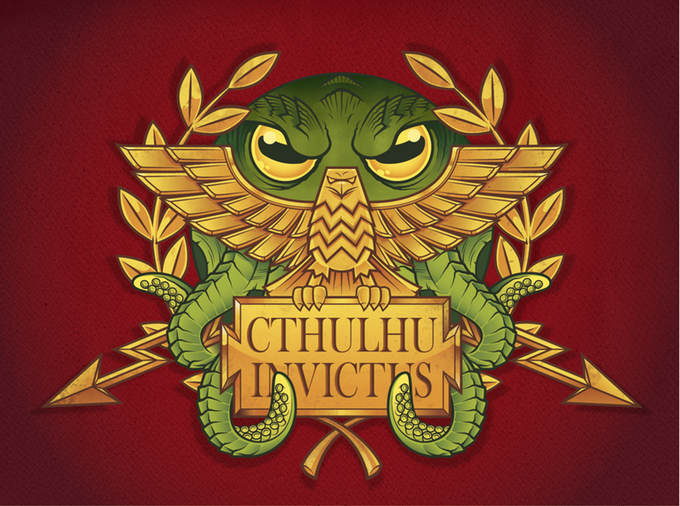 The Idol of Cthulhu Kickstarter is for more than just an adventure in a book or pdf. They've got every angle covered, with ambiance music, props, and more. If you're in charge of a Call of Cthulhu game, you'd do right by your players to go check out the Kickstarter campaign. Everybody go crazy! There's a new adventure for Call of Cthulhu up on Kickstarter! Ok, maybe don't go crazy, literally. That would inhibit your playing ability. Though, being Call of Cthulhu, it's highly likely that your character will go crazy. That's just sort of par for the course. I know we don't report much on all the various LCGs that Fantasy Flight (or anyone else) puts out, but with something like this, we figure it's justified. 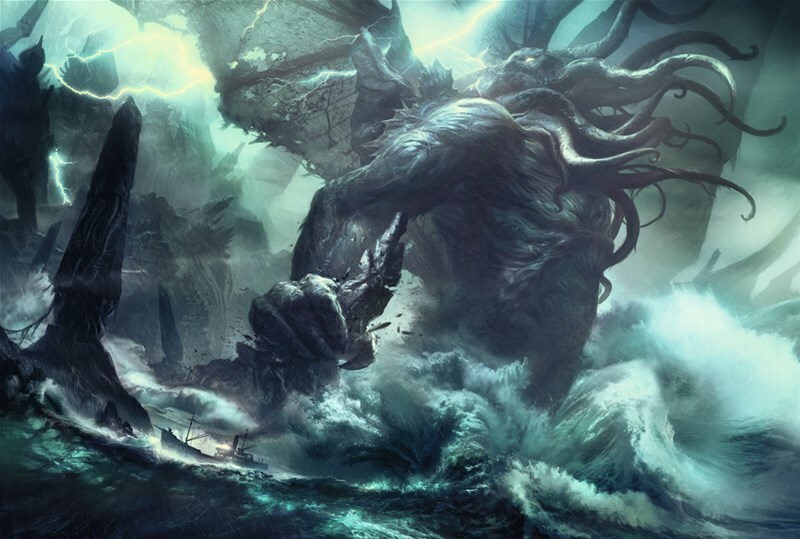 Fantasy Flight Games has announced that they will be bringing the Call of Cthulhu card game to a close. They say all good things must come to an end. This is one of those cases. Moon Design Publications is now part of the Chaosium ownership. Chaosium is now the licensed publisher for RuneQuest, HeroQuest, and various items from the Gloranthan universe. 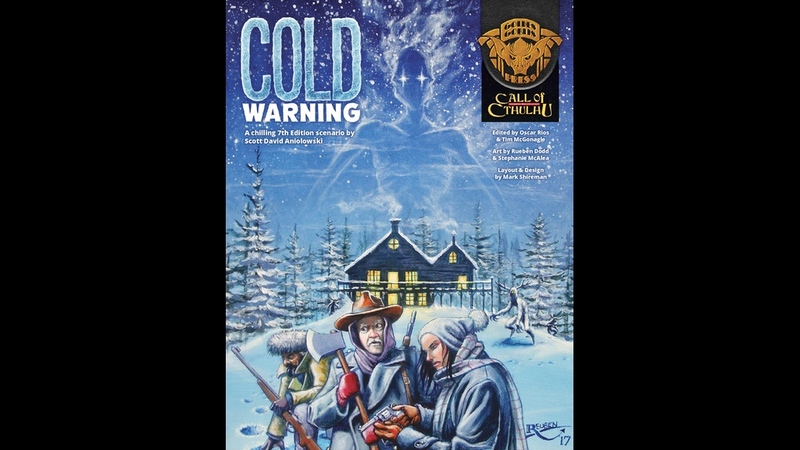 They will also continue to publish the Call of Cthulhu line. 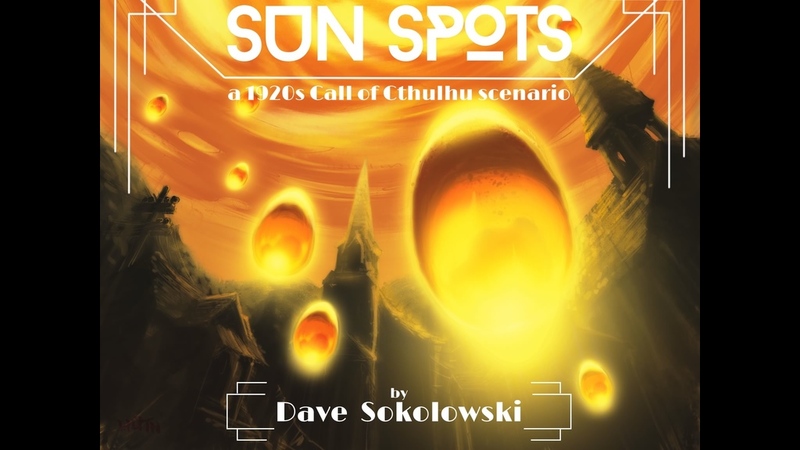 This means that Moon Design Publications will now be fulfilling all the Call of Cthulhu 7th Edition Kickstarter orders. Chaosium is hitting the wayback button and going back to their roots with some new old staffing. First off, Greg Stafford, founder of the company and a major creative force during the formative years of the company in the 1980s, is back as the President. Also rejoining the ranks is Sandy Petersen. Who's that? Oh, only the designer of Call of Cthulhu to gaming tables to begin with. So what do these two have in store for Chaosium? 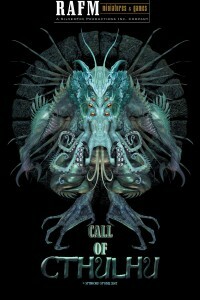 Chaosium is coming out with a new edition of the long-standing gaming staple, Call of Cthulhu. They've released the Quick Start version of the game. “That is not dead, which can eternal lie, and with strange aeons even death may die.” Call of Cthulhu rises from the grave with a new edition. TGN’s Enrico Nardini unearths this eldritch tome at the risk of his sanity. Though, we're not entirely sure he was all that with it to begin with (just kidding, Enrico!). Get ready for another TGN Feature. This time it's Call of Cthulhu 7th edition QSR. 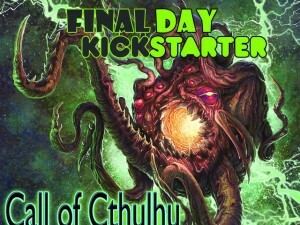 RAFM has just a few hours left for their Call of Cthulhu 7th edition miniatures Kickstarter. They're breaking through stretch goals fairly regularly, so don't miss out on the action. We made it over $36,000.00! Congratulations to all our backers! We have opened up the Stretch Goals to $45,000.00. We have added two new stretch goals at this time. There are new stretch goals at $39,000 and $42,000.00 to go with our $45,000 Stretch Goal. This means lots of new stuff to open up! Come over and check it out. Our first Stretch Goal is Shub-Niggurath and it will be added to Expansion Set #4. This Stretch Goal will unlock at $39,000.00. Shub-Niggurath will be a large size figure and will stand over 120mm tall. RAFM has less than 3 days to go in their Call of Cthulhu 7th Edition Miniatures Kickstarter. 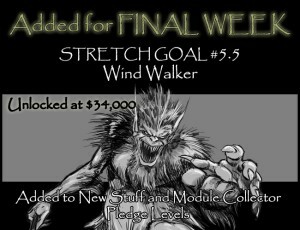 They've made it through another stretch goal and lowered the level for more of them. So there's plenty of goodies for your pledge if you join. The GOO is upon us! The Wind Walker has arrived! Oh the Madness! Ph'nglui mglw'nafh Cthulhu R'lyeh wgah'nagl fhtagn! The $34,000 Stretch Goal has been opened at the $33,753.00 mark. Also, it is official, we have enough Pre-orders, the Great Old One model will be produced. 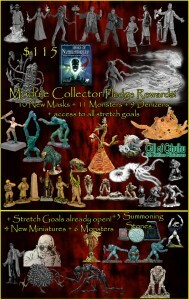 Thanks to all who bought into this official RAFM Call of Cthulhu miniature! RAFM has just 5 days left in their Call of Cthulhu campaign. They've made more than 5x their goal, so your pledge gets you extras and goodies and all that fun, insane stuff (insane because it's Cthulhu, of course). 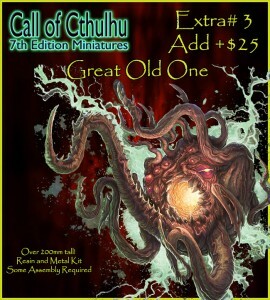 RAFM Call of Cthulhu 7th Edition Miniatures has entered the final week of its funding program. 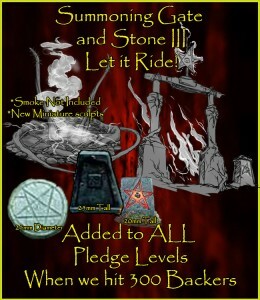 We have opened new Stretch Goals and new Pledge Levels. Get new Monsters with the Monsters Pledge Level. A Retailer Pledge level has also been added. Come and check out the website for these new options. Featuring the art of Christopher Burdett in the piece "Great Old One" coming to life in resin and metal. Come get your copy today! RAFM has made it up and over $31k in their Call of Cthulhu 7th edition miniatures Kickstarter. There's still 12 more days to get in on this project. Our thank you to all our supporters is to open the $31,000 stretch goal early. Two new miniatures have been added to the Module Collector Pledge level bringing your goodies to over $290.00 MSRP value. Thanks to all our Summon New Byakheers and Contact Chthonian Supporters who joined us and thanks to all our pledgers who got the word out. Our second thank you is to Let it Ride! That's it, double down, as it were. What does this mean? Our current Contact Chthonian Supporters opens at the 300 Backer level. We are willing to open the 250 Backer stretch goal, as well as the 300 Backer stretch goal to ALL Pledge levels if we make it to 300 Backers. We have up until 12am EST on January 31st, 2014 to achieve this goal. Let's go get some new backers. Silver Fox Productions has made it up and over their $25k stretch goal for their RAFM Call of Cthulhu 7th Edition Miniatures Kickstarter campaign. With two weeks to go, there's still time to get in on this. We have updated the page to support the $25,000 stretch goal being met. As promised we posted the concept art of the Deep One Ogres but we went with Father Dagon and Mother Hydra as names for the pieces. See the concept art area. Thanks for the ideas keep them coming! Stretch Goal for $31,000 level has been added. We are looking forward to reaching $37,000, that will be the next big goal, so let's get to $31,000 so we can see the goodies. Our current Module Collector Pledge gives you MSRP of $270.00 worth of metal miniatures for the low price of $115.00 CAD + shipping. Come over and join in the madness! 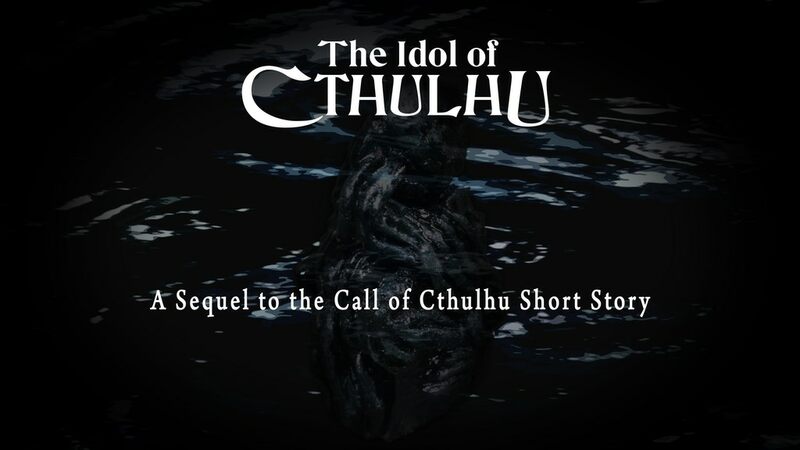 Silver Fox Productions has launched their Kickstarter campaign for the 7th edition miniatures for Call of Cthulhu. 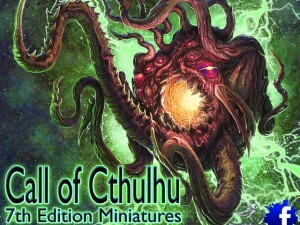 The officially licensed RAFM Call of CthulhuMiniatures are award winning and an iconic leader in the horror genre within the gaming industry for decades. Originally launched in 1985, the line still draws the interest of hobbyists around the world. 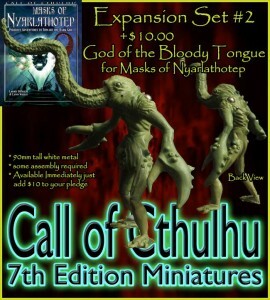 It is clear that loyal Call of Cthulhu fans want these miniatures to support their gaming. And why not? They're awesome miniatures at a terrific price! RAFM will be launching a new Call of Cthulhu Miniatures Kickstarter campaign starting in just a couple days. Silver Fox Productions Inc. will launch their new fundraising program for RAFM Call of Cthulhu 7th Edition on Kickstarter on January 22, 2014. This program will be open to supporters until Febuary 11, 2013. So find us on Kickstarter and support our new miniatures. 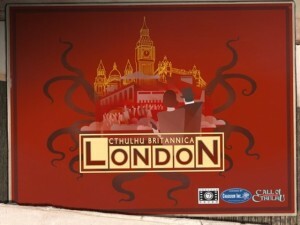 Cubicle 7 has a Kickstarter campaign running in order to fund Cthulhu Britannica: London, a Cthulhu RPG box set. We want to make the ultimate boxed setting for 1920s London for the Call of Cthulhu roleplaying game. Beautiful artwork to inspire you, gorgeous maps to lose yourself in, evocative tomes on the city and its Mythos secrets to terrify, enthral, and immerse you in the glamour and smog of the capital of the Empire. This is a project that has been years in the making, and has attracted a huge amount of support from the community, with the biggest stumbling point is that smaller-volume print runs of boxed sets just don’t work financially. Kickstarter gives us the chance to overcome that hurdle and bring you the ultimate 1920s Cthulhu London setting. As well as the fantastic boxed set, you can also get original content from a dazzling array of gaming luminaries. First up is a series of postcards you can use as inspiration or in-game handouts, with the initial postcard written by none other than Sandy Petersen. Sandy designed the Call of Cthulhu RPG, numerous other games and adventures, and most recently the Cthulhu Wars boardgame. RAFM added a new Retailer Option to their Call of Cthulhu miniatures Indiegogo campaign. "SCROLL TO THE BOTTOM OF THE PAGE"
This Perk is for Retailers Only. You must possess a Business License and a storefront to order this Perk. Get three blister packs of each figure that the funding program generates. This includes access to all stretch goals that may be achieved for both Monsters and Investigators. Shipping is included anywhere in the world. RAFM made it up and over their funding goal for their Call of Cthulhu Miniatures. They've also added on... well... new add-ons for those that have pledged already. A perk for the new Insanity Add-on has been posted. 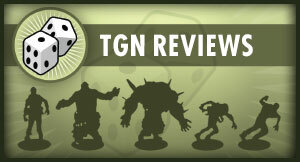 Get $40 worth of miniatures from the existing line for a +$20 add on to your existing Perk. You must have purchased a Perk previously to take advantage of this add-on. There are only 100 available so here is a chance to get those miniatures you want for half price. RAFM Miniatures is showing off some more preview artwork as well as the first finished green for their Call of Cthulhu minis line up on Indiegogo. We have added a picture of the first miniature of the initial release in the Gallery. We would like to thank our current funders who have made this possible. 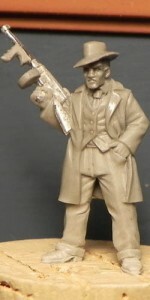 This figure has been sculpted by James Van Schaik and is his version of the Gangster concept art.